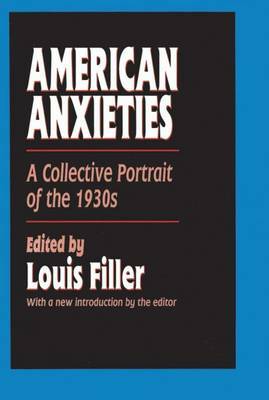 American Anxieties is a brilliant, unorthodox portrait of the 1930s. Filler does what others have tried, but few have succeeded in accomplishing: he captures the continuity between the 1930s and the 1990s. He does this less by personal accounts or statistical comparisons, than by the emphasis upon a common core of concerns that link the recent past with the present in American society and culture.The decade of the 1930s was unique in the history of the United States. The commercial order that prevailed from the Civil War to the Roaring Twenties, and had pervaded every aspect of American life, was reeling under the weight of a massive depression and a world made weary by militarism. The response was a rediscovery in America of the pioneer virtues of cooperation and solidarity.American Anxieties provides a collective portrait of an era: that blend of fear, hope, excitement, anger, and joy that everyone who lived in that time will feel again; for those too young for that time, it links the 1990s with the emergence of a powerful black culture, studies on women by men and women, and the rediscovery on a large scale of ethnicity. Far from being a stereotypical statement of the "proletarian thirties," Filler's work is--in his own words, and in those of great writers of the time--a multicultural and multifaceted tool of broad pedagogical and personal use. Included in the volume are major writings of Albert Jay Nock, John Dewey, Edmund Wilson, Meyer Levin, Milton Hindus, John Dos Passos, S. J. Perelman, John Steinbeck, and many others.